Unless you’ve been living under a rock, you’ve heard all about the oil spill crisis in the Gulf of Mexico and British Petroleum’s attempts to fix or plug the leak. Obama’s approval rating lately has gone in the crapper. Everyone in the country thinks he should have responded faster, and 50% of the country thinks this could be Obama’s “Katrina” incident, meaning, this could be a turning point in his presidency. 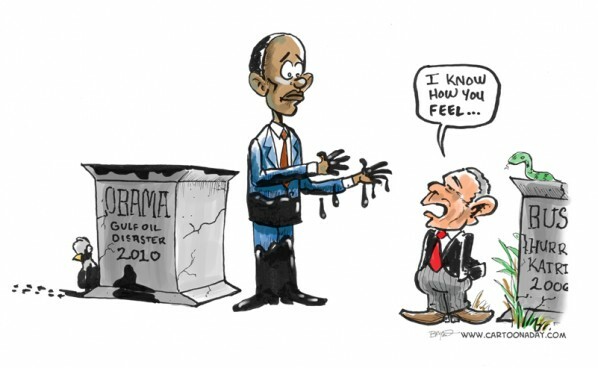 President Obama stands covered in oil next to his pedestal. He appears sad as President Bush relates to him on a personal level. Inspiration: Inspired by recent news of the "Top Kill" procedure, Obama's next visit to the Gulf Oil crisis and Obama's declining approval rating.